James E. Bennett, born Jun 13 1913, Michigan; died Feb 6 1996, Port Huron, Michigan. Erie Alta Bennett, born Jan 7 1916, Port Huron, Michigan; died Jun 24 2005, Harlingen, Texas; married 1) Clifford Howard; 2) Margarito Vasquez. 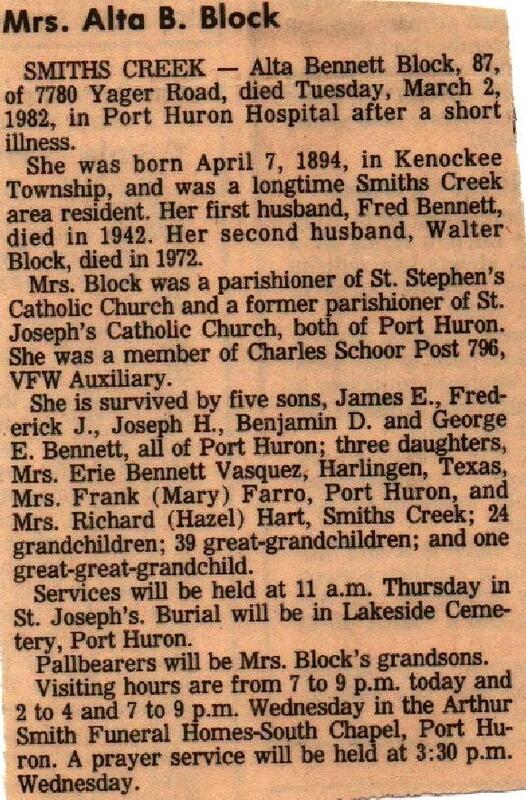 Margaret Bennett, born Dec 20 1930, Michigan; died Feb 27 1966, Goodells, St. Clair County, Michigan; married Lambert McCombs. Maryann Bennett, born c1935, Michigan; married Frank Farro. Hazel Grace Bennett, born c1939, Michigan; married Richard Hart. Bennett, Fred, head-of-household, age 34, born in Michigan; parents born in Michigan; owned home (free); occupation: contractor. Bennett, Alta, wife, age 26, born in Michigan; parents born in Michigan. Bennett, James, son, age 6, born in Michigan; parents born in Michigan. Bennett, Erie, daughter, age 4, born in Michigan; parents born in Michigan. Bennett, Frederick M, head-of-household, age 43, born in Michigan; parents born in Canada; first married at age 26; owned home ($1500 value); no radio in home; occupation: business proprietor, retail grocery; not a war veteran. Bennett, Alta B., wife, age 37, born in Michigan; father born in Canada; mother born in Michigan; first married at age 18. Bennett, James E., son, age 16, born in Michigan; parents born in Michigan; occupation: sailor, steam boat. Bennett, Erie A., daughter, age 14, born in Michigan; parents born in Michigan; attended school. Bennett, Frederick J., son, age 10 [or 19? unclear], born in Michigan; parents born in Michigan; attended school. Bennett, Benjamen D., son, age 2 years 6 months, born in Michigan; parents born in Michigan. Bennett, Joseph H., son, age 6, born in Michigan; parents born in Michigan. Bennett, George E., son, age 1 year 6 months, born in Michigan; parents born in Michigan. Bennett, Fred, head-of-household, age 54, born in Michigan; completed 3rd grade; on Apr 1 1935 was living in the same place/city; owned home ($900 value); occupation: laborer, building contractor. Bennett, Alta, wife, age 48, born in Michigan; completed 6th grade; on Apr 1 1935 was living in the same place/city. Bennett, Fred Jr, son, age 20, born in Michigan; completed 8th grade; on Apr 1 1935 was living in the same place/city; occupation: janitor, bowling alley. Bennett, Joseph, son, age 16, born in Michigan; completed 7th grade; on Apr 1 1935 was living in the same place/city. Bennett, Ben, son, age 14, born in Michigan; completed 4th grade; on Apr 1 1935 was living in the same place/city; attended school. Bennett, George, son, age 12, born in Michigan; completed 4th grade; on Apr 1 1935 was living in the same place/city; attended school. Bennett, Margaret, daughter, age 9, born in Michigan; completed 1st grade; on Apr 1 1935 was living in the same place/city; attended school. Bennett, Maryann, daughter, age 5, born in Michigan; on Apr 1 1935 was living in the same place/city. Bennett, Hazel Grace, daughter, age 1, born in Michigan. Contribution from Mark Purtle (). 1900 census, 7th Ward, Port Huron City, St. Clair County, Michigan; roll T623-742, ED 103, page 10A, line #9, dwelling #218, family #219. 1920 census, Port Huron, St. Clair County, Michigan; roll T625-795, ED 115, page 7B, line #74, dwelling #175, family #181. Ancestry Family Tree data "Jones Manning family tree" posted by "Jones Manning". 1910 census, 7th Ward, Port Huron City, St. Clair County, Michigan; roll T624-673, ED 115, page 129A, line #2, dwelling #179, family #181. 1930 census, Port Huron, St. Clair County, Michigan; roll T626-1025, ED 28, page 1B, line #98, dwelling #24, family #27. 1940 census, Port Huron, St. Clair County, Michigan; roll T627-1816, ED 74-38, page 15B, line #50, household #339.